From left to right: Randy Rasmussen, Greg Madson, Tyson Madson, Sherri Madson, Principal Jamie Kent and Mark Taylor gather for a photograph after the mock graduation held Friday at North Park Elementary School in Tremonton on Friday, Jan. 18, 2019. 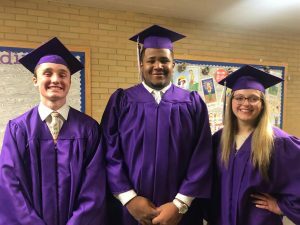 Box Elder High School held a mock graduation Friday, Jan. 18. There were about 60 people in attendance to see the ceremony for an all-region football and basketball player. Tyson Madson, a 6’4’’, 300 pound lineman has several colleges looking at him to play football for them. Box Elder High School Student Body President Jarom Olsen (left), Tyson Madson (center) and Senior Class President Savanna Crane (right) honor Tyson’s mother by participating in a mock graduation ceremony Friday, Jan. 18, 2019. The ceremony was held in Tremonton’s North Park Elementary School’s multi-purpose room. The tables had purple table coverings, as well as balloon and flower decorations. The ceremony was not so much for Tyson, as it was for his mother, Sherri. Greg Madson, Tyson’s father, said Principal Jamie Kent reached out to the family and asked if they could do the mock graduation. Sherri has suffered from ulcerative colitis since she was 21 and now, at 54, she has developed terminal liver cancer. Sherri has been through any and all treatments offered and has exhausted all options. The prognosis is not good at all, with only a few months to live – meaning she’d most likely miss Tyson’s graduation ceremony. Tyson is their youngest child. Annette Whitaker, a counselor at the high school, and Kent were talking one day and realized this was a wish they could help grant. It was a way to give back to someone who has helped the school district and thousands of students for so many years. 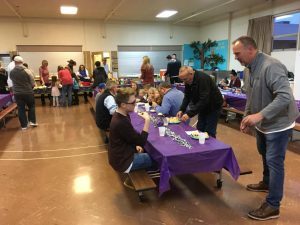 Friends and family share a meal after the mock graduation held at North Park Elementary School in Tremonton on Friday, Jan. 18, 2019. The mother of five recently started to use her sick leave, after 18 years as a teacher and six years as a guidance counselor. Leaving her work was not an easy thing to do. HOPE Squad is a peer support team that provides service and support to students and the community to prevent youth suicide and suicidal behaviors; and, improve the access of appropriate prevention services for vulnerable youth groups and high-risk individuals. Once they got started the two, Kent and Whitaker, were surprised at how many people wanted to be a part of what they were doing. She said it was neat to see everyone step in and help. Some of Tyson’s teachers and administrators wanted to be at the ceremony. Assistant Box Elder County School Superintendents Keith Mecham and Gary Allen were on the stand supporting the event. Mecham was Tyson’s middle school principal and Sherri’s boss, while Allen was his high school principal for two years. Kent thought it was a great tribute to Sherri. “I think it was amazing, all the people that wanted to help. I was really touched by how many really cared. 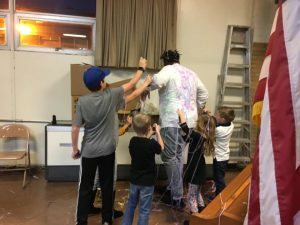 Tyson Madson gets blasted with silly string from his nieces and nephews. Greg said their family is starting a foundation, The Madson Foundation, that will award a college scholarship to a senior from Box Elder High School and Bear River High School. More information on the foundation will be online soon. Or you can text or call Greg Madson at (435) 279-4101.